In honor of National Dog Bite Awareness week, April 7-13, 2019, we thought we would share with you some recommendations about avoiding common situations that increase the chances of a dog bite to humans or other animals. If are near the Charlottesville area and your dog has bitten a family member, call us and we can set up an appointment to develop a health and safety plan for the animal. Many dog bites can be prevented by understanding the signals animals give when they are becoming increasingly anxious or agitated. Some of these are very straightforward, but others may surprise you. The vast majority of dogs will show subtle signs that they are uncomfortable well before they resort to biting. That said, before interacting with a dog in any way – there are some key things to evaluate. Most likely to be bitten are children and seniors. Children are much more likely to be bitten due to differences in impulse control and ability to understand signs that the dog is becoming increasingly uncomfortable. In 2017, nearly 10,600 children aged 2 and younger experienced dog bites that resulted in visits to the emergency room. According to the AVMA, bites most commonly occur with familiar animals and can happen due to a variety of reasons. This is the first thing to rule out when an animal has behaved aggressively, especially for the first time. Some types of pain and illness are obvious; however many animals hide their pain relatively effectively. Chronic pain from osteoarthritis can be hard for owners to notice as they live with the animal and see it on a day to day basis. Age-related changes such as declining eyesight and hearing can also make sudden petting or interaction more startling. Combine either of these changes with a toddler who may approach rapidly and not-so-gently pet an older animal’s sore hips or back, and you have a recipe for potential pain and fear-related aggression. Animals can develop fear and anxiety at any point in their lives. Although some animals have a history of neglect or trauma, this is not required for them to exhibit fearful/anxious behavior and aggression. Some common signs of anxiety in dogs/cats can include: attempting to remove themselves from the situation, avoidance of eye contact, licking their lips or yawning, drooling, lowered ears, tucked or lowered tail. There are some great illustrated examples of signs of fear and anxiety in pets online. Some animals will develop aggression related to resource guarding or protecting humans or things (toys/food/etc). This too can develop at any time throughout their life. Always be alert when feeding or interacting with an animal. While true conflict aggression is not a common cause of aggression, it can occur when there is aggression related to reprimands or intervention in a valued resource. This occurs rarely, and in cases of true dominance-related aggression, there is no fear or uncertainty present. Keep in mind that some fearful/anxious dogs may have learned to minimize or abbreviate their display of fear and uncertainty because they have learned that behaving aggressively removes the fearful person/object/etc. In those cases, dominance aggression is not present. Observe Where The Animal Is And Who Is With It – If the animal is alone, use caution as it can be very difficult to predict how used to interaction it will be. It is often best in cases where an animal is alone to either not interact with the animal at all or, if you are concerned that it is lost or in danger, contact animal control. Never try to make contact with an animal that is behaving neurologically abnormal. Ask The Dog’s Owner For Instructions – Always ask the person prior to leaning toward, touching or approaching the pet in any way. Just because the pet may appear happy and relaxed with the owner, does not mean that it will be so with you- even if you’ve met the pet previously. Teach Children How To Interact With Dogs – If you have a child —especially any children under 10-years-old— work on teaching them how to approach animals, when to approach them and signs that the animal is wanting a break or may be experiencing stress. Having respect for our cuddly friends can go a long way in reducing episodes of aggression and biting. If a dog bites a human, many people believe it must be put to sleep, as it has now “developed a taste for it.” This idea is untrue. 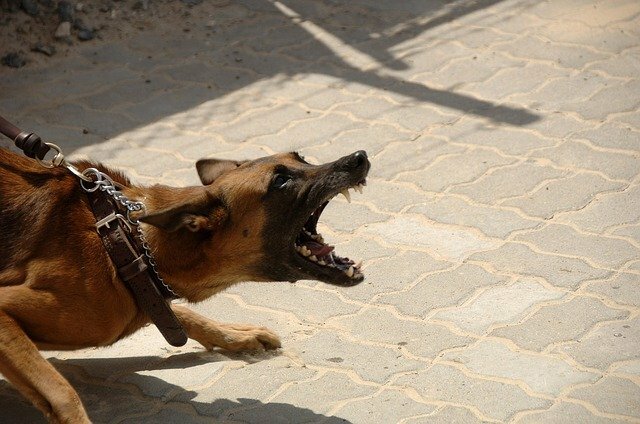 If a dog bites a human, it is essential that the human be taken to their emergent or primary care physician to have their bite evaluated. For the animal, it should be taken to a veterinarian where it can be examined, the circumstances reviewed and a plan can be developed for the health and safety of the family, dog and the community. In some circumstances, an animal control officer may be involved. It is important to remember that if and when a dog bites, it is often, although not always, due to fear, anxiety or discomfort and may have been inadvertently provoked by someone not paying attention to its warning signs. There are numerous studies suggesting that breed does not accurately predict whether or not an animal is likely to be aggressive. Regardless of breed, use caution with animals you don’t know, and always pay attention to the signals that an animal is giving, even if you’ve interacted with them previously. If you’re experiencing any concerns about your pet’s behavior, contact VETSS and our veterinarians will evaluate the animal to determine if medical care or further behavioral assessment is recommended. The good news is that many times anxious or aggressive behavior can be managed well with a veterinary behaviorist or by treating the underlying disease. As always, we are here to help so if you have any questions let us know! For more information, contact our team at VETSS! National Dog Bite Prevention Awareness week has passed but, Dr. Miller has provided us with an amazing blog to read in keeping people and animals safe. Since the weather is warming up and more people are taking their pets out with them this is a good blog to read and reference back to for proper handling and warning signs of what may cause a dog to bite and how to avoid it. More than 350,000 people are bit by dogs each year. Learn the facts to protect yourself and your family from dog bites. Veterinary Emergency Treatment Services & Specialty Veterinary Emergency Treatment Services & Specialty added 16 new photos — at Veterinary Emergency Treatment Services & Specialty.